SUNDAY will see the biggest game of the AFL Women’s calendar, with minor premiers of both Conference A and Conference B, Adelaide and Carlton making it to the 2019 AFLW Grand Final. A battle of conferences is a fitting way to end the 2019 season, with both sides hopeful for their best win of the season. Carlton showed a new side of their team in last week’s first preliminary final against Fremantle, convincingly outplaying the Dockers and beating them by 36 points to lock in an inaugural grand final appearance. Adelaide put up a stellar performance against Geelong in the second preliminary final, running over the Cats by a painful 66 point margin and locking in a home grand final on Sunday afternoon. 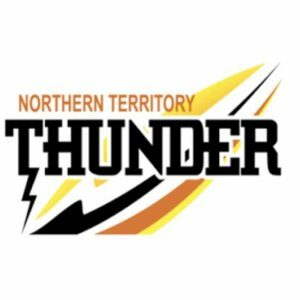 This week will see Adelaide as strong contenders for their second AFLW Grand Final win, only the first club in a position to do so after the competition’s inception in 2017, while Carlton will hope to pull off a big upset similar to their performance last week in order to get the win in front of a hostile Adelaide home crowd. Carlton’s strong win against favourites, Fremantle last week sees the Blues make it into their inaugural Grand Final, while the Crows are the first side to take the field in a Grand Final with one trophy already under their belt, meaning this match will be a one to add to the record books regardless of the outcome. While the Conference system is the only reason Carlton were able to make finals, this match will be a big indicator of the difference between Conference A and Conference B, unless Carlton are able to pull off another shock victory to take out the 2019 AFLW Grand Final. That being said, Carlton have produced fighting scorelines in majority of their matches, winning five of their last six matches to make the Grand Final, so do have the potential to give Adelaide a run for their money. The Crows have won their last seven matches, the first of their run against Carlton in Round 2 2019, so will want to keep their fine form going with another win to add to their season tally. 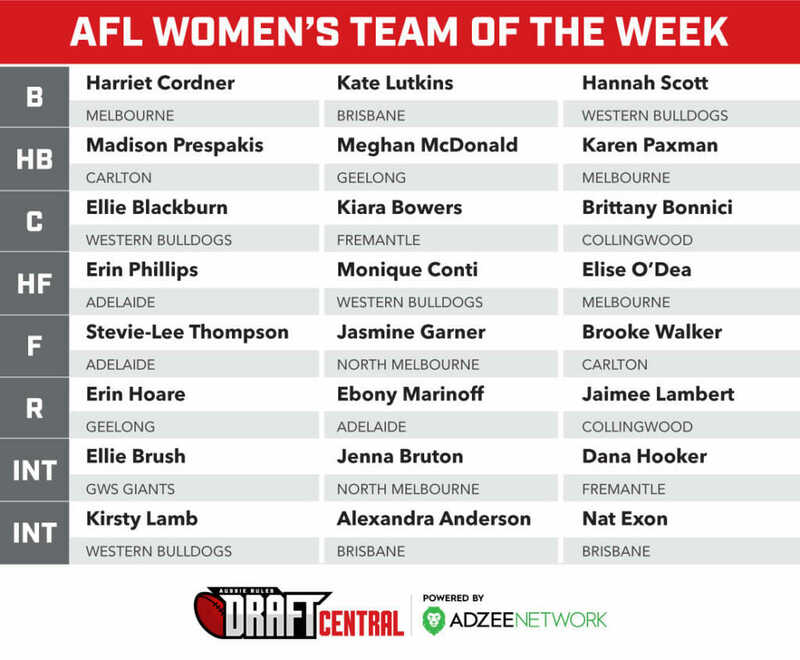 From the two sides in the mix this week, Carlton’s Madison Prespakis, Lauren Brazzale and Brianna Davey stood out in the big win against the Dockers, with 57 touches, 11 tackles, nine marks and a goal between them. 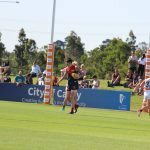 Adelaide’s Ebony Marinoff, Jess Foley and Erin Phillips were among the best in the team effort against Geelong, with a combined 69 disposals, 21 tackles, 11 marks and three goals. Last time they met saw Adelaide prevail as Carlton threw all they had at the Crows, going down by only 13 points in Round 2 at Ikon Park (Carlton 7.2 (44) to Adelaide 9.3 (57)). The Blues led for a good part of the game with a good run out of defence, but struggled with forward options after Tayla Harris was a late omission from the side, allowing turnovers by a clinical and offence-driven Crows side. The Blues’ relentless forward push did mean some goals were bound to break through the Crows’ backline, however a late push from the visitors saw the two sides combine for a competitive seven goal third term, effectively taking the Crows back into the lead ahead of the last quarter. A three goal to one burst in the final term saw Adelaide come away with their first win for the season, while Carlton came away with a lot to think about and build on for their next matchup. Adelaide’s small forwards were at their best in Round 2, with Stevie-Lee Thompson (four goals, 17 disposals) and Eloise Jones (two goals, five tackles) putting on a show in front of goal and poking holes in Carlton’s defence. Anne Hatchard and Erin Phillips dominated around the ground with 43 touches and 10 marks between them, while Jess Foley had the 17 hitouts and Ebony Marinoff added eight tackles to her season tally. Carlton had a good game in front of the big sticks, only registering two behinds for the day with six individual goalkickers, but were unable to capitalise on opportunities credit to Adelaide’s pressure around the ground and the Blues’ forward 50. Natalie Plane had her best game for the season, kicking two goals and racking up 11 touches and three tackles, while Kerryn Harrington and Madison Prespakis were among Carlton’s best, racking up 20 disposals apiece, with Prespakis kicking her debut goal in AFLW and Harrington notching up six marks. Shae Audley and Amelia Mullane managed seven and six tackles, respectively. IN the Round 7 edition of number crunching we reveal who fared best in each stat, including a nod to regular game breakers, Jenna Bruton and Erin Phillips, and a number of other players who managed to dominate multiple areas. Jenna Bruton tried her heart out for North Melbourne in a losing effort in their do or die clash on the weekend against Fremantle. Bruton was outstanding for the Kangaroos, collecting a round high effort of 19 kicks from 26 disposals. Teammate, Emma Kearney was not far off the mark as she amassed a whopping 17-contested possessions, the most of any player. Given both players took the field for the losing side, this is a testament to how well Fremantle played on the weekend to earn a finals spot. At the conclusion of the home and away season Fremantle’s Kiara Bowers heads the tackle count with 83, sitting 21 clear of next on the table. Bowers is likely to continue her good tackling form in finals and is sure to push to maintain her strong lead. Collingwood forward, Sarah D’Arcy convincingly beat the Brisbane defence and was a constant threat in the air in Round 7. Four of her 11 marks were contested, both the highest tally in the round by some margin. Carlton’s Brooke Walker was a surprise package in the last round of the season, kicking a career high three goals to be the highest individual goalkicker this round. Hopefully she can continue this good form heading into Carlton’s inaugural AFLW finals run this week. At the conclusion of the 2019 AFLW home and away season, Adelaide’s Stevie-Lee Thompson has kicked the most goals, with 13 majors from seven games and finals footy on the way. 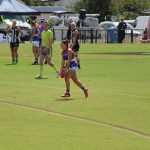 North Melbourne’s Emma King showed her versatility, moving back into the ruck after spending time up forward in recent weeks. She had the most hitouts on the weekend with 32, well up from her average of 17. Collingwood’s Ash Brazill was instrumental from half-back and incredibly composed in her sides first win for 2019 over Brisbane, managing 14 effective kicks of 19, from 23 disposals, setting a new AFLW record. CRUNCHING the numbers in Round 6 of the AFL Women’s competition reveals who fared best in each stat, including a nod to the players who managed to dominate multiple areas. Carlton young gun, Madison Prespakis performed to the highest degree in the engine room for the Blues, collecting the highest amount of possessions of anyone over the past weekend with 27 touches in the Blues’ win over Brisbane. Dockers utility, Kiara Bowers was on track to break Ebony Marinoff’s AFLW tackle record from last season, when she had 13 to her name at the main break. Bowers finished with 19, which is still a monumental effort. Melbourne defender, Harriet Cordner led the way with seven one percenters against the Western Bulldogs. 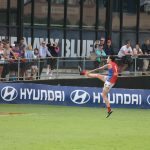 She was a major reason along with Tegan Cunningham as to why the Demons won the thrilling contest against the Western Bulldogs. Adelaide’s Stevie-Lee Thompson moved three ahead of teammate, Erin Phillips in the AFLW goal kicking tally with three goals on the weekend. The small forward has amassed twelve goals in six rounds, with one match remaining. Geelong’s Erin Hoare and Carlton’s Alison Downie were among the select few who managed 100 per cent disposal efficiency in round six. 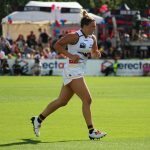 Phillips, who has one hand on the AFL Women’s Coaches Award (AFLWCA), dominated the air against the GIANTS. She took four contested marks, which led the competition on the weekend.